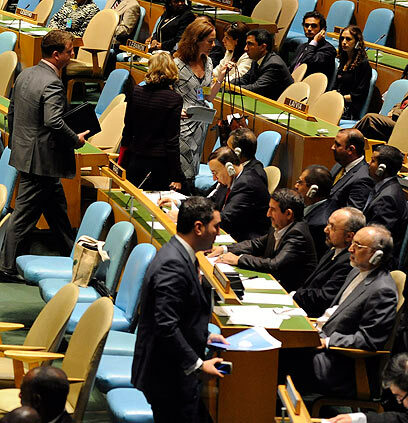 Iranian President Mahmoud Ahmadinejad addressed the United Nations General Assembly on Thursday. As usual, the head of the Islamic Republic blamed the United States, Israel and the West for provoking wars and "spreading totalitarianism and perpetrating slavery and colonialism." Ahmadinejad began by saying he "plans to analyze the current (global) situation from a different angle," and quickly blamed the “arrogant powers of the West" for causing worldwide recession and all manners of social inequalities. Soon after he began lashing out at the UN-member nations, the American and French ambassadors, all European Union delegates and dozens of other delegates with them, walked out of the Assembly Hall.Israel and Canada announced they would be boycotting the Iranian president's speech ahead of time. Ahmadinejad quickly made his first reference to Israel and Zionism, saying that the "Zionist regime imposes homelessness, terror, and mass murder on the Palestinian people." "The world must wonder," he continued, "(…)If after six decades the Holocaust is still used as an excuse to pay ransom to the Zionists… what will happen if the same amount of money was allocated to poor nations?" He further blasted the West for treating "Zionism as if it was a sacred ideology." He further accused NATO of sanctioning and allowing drug trafficking, claiming that production of illegal drugs has increased despite NATO's "occupation." He then questioned the US' assassination of al-Qaeda leader Osama bin Laden, suggesting that the incident was meant to cover up "a conspiracy surrounding the 9/11 attacks." Ahmadinejad said that the "arrogant powers" threaten anyone who questions the Holocaust or the events of September 11 attacks with sanctions and military action. The Iranian president made no reference to the Arab spring or the nearing Palestinian bid for UN recognition. A White House statement dismissed Ahmadinejad's attack on US policy and accused Iran's government of "vile mistreatment" of its own citizens: "I find it rich that the Iranian president would have such criticism," White House spokesman Jay Carney said. The 66th UN General Assembly opened on Wednesday, with speeches by US President Barack Obama, UN Secretary-General Ban Ki-moon and French President Nicolas Sarkozy, as well as other prominent statesmen, who addressed various issues on the global body's agenda, such as the Arab Spring, the war on terror and the upcoming Palestinian statehood bid. See all talkbacks "Ahmadinejad: Zionist regime is not sacred"